Born in 1873, Saint Therese was the youngest of five daughters born to very devout parents. Therese grew up sensitive and a little selfish. Three of her older sisters entered convents, and Therese wanted to go, too, but she knew that she couldn’t handle being a religious sister if she couldn’t control her emotions. She prayed that Jesus would help her. The Christmas she was 14, her father said something harsh, but instead of crying, Therese considered her father’s feelings more important than her own. That was the moment of her answered prayer. Therese soon entered the Carmelite convent, but she had trouble praying, and she worried about her father, who had taken ill. Therese learned that she could do little things throughout every day to show her love for Jesus. Now we call her the “Little Flower” and her spiritual teachings the “Little Way” – trusting Jesus to make us holy and doing of small things to serve God and others. 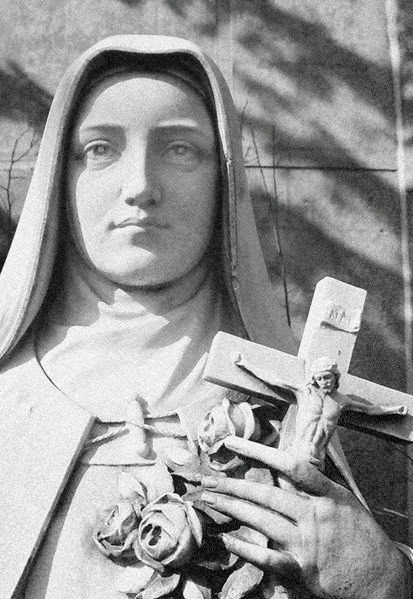 St. Therese made it a practice to do ten things a day for others. She used a little string with beads to keep track. Make your own Sacrifice Bead String today using twine, 11 pony beads and a couple of religious medals or charms. Then put them into use. Last year, we wrote encouraging notes and tied them to flowers to give to people.